Hi everyone! Are you ready for the holiday season? I have to say that Christmas is my favorite holiday of the year. And it’s not just because of the presents, but much more importantly, I get to spend quality time with the people I care about the most in this world. And most importantly, it’s the time to celebrate what Jesus did to save and redeem my life for eternity. Another amazing thing about the holidays is the special collections that different nail polish brands, large and indie, that are filled with festivities. So, following my last post of FUN Lacquer 2013 Christmas Collection swatches and nail art tutorials, I bring you two polishes from Revlon’s new Parfumerie Scented Nail Enamel collection. It’s not exactly a Christmas release, but the ones I chose (color and scent) are perfect for the holiday season. From their print ads in Canada, these are limited edition. However, it seems that they’ve confirmed the collection has been made permanent, at least in the US. I’m in no way affiliated with Revlon as these are my own purchases, so, I will simply say that if you like them, go ahead and get them like you would any other polish. To begin, let me just say the two I picked smell delicious to me! The scent, as Revlon advertised, is a soft and light fragrance. Normally, based on my previous experiences with scented polish, I wouldn’t say I’m a big fan of them. But, Revlon really did a great job here. I would say the Parfumerie collection polishes smell similar to when I wear scented hand lotion. The scent was not affected by topcoat and lasted for 4 days on me, gradually fading each day. The formula was amazing. Both took basically one coat to reach opacity. I’ve applied some nails with 2 coats and some with 1 coat for you to compare. However, please note that even with topcoat, they began to have tip wear by the second day. Here’s a color swatch to show you the complexity of color and texture. I also love the bottle design for this line. The sturdy square glass really does look like little perfume bottles. The round cap is a bonus in my opinion. It adds more shape to the otherwise rigid looking bottle and works really well during application. 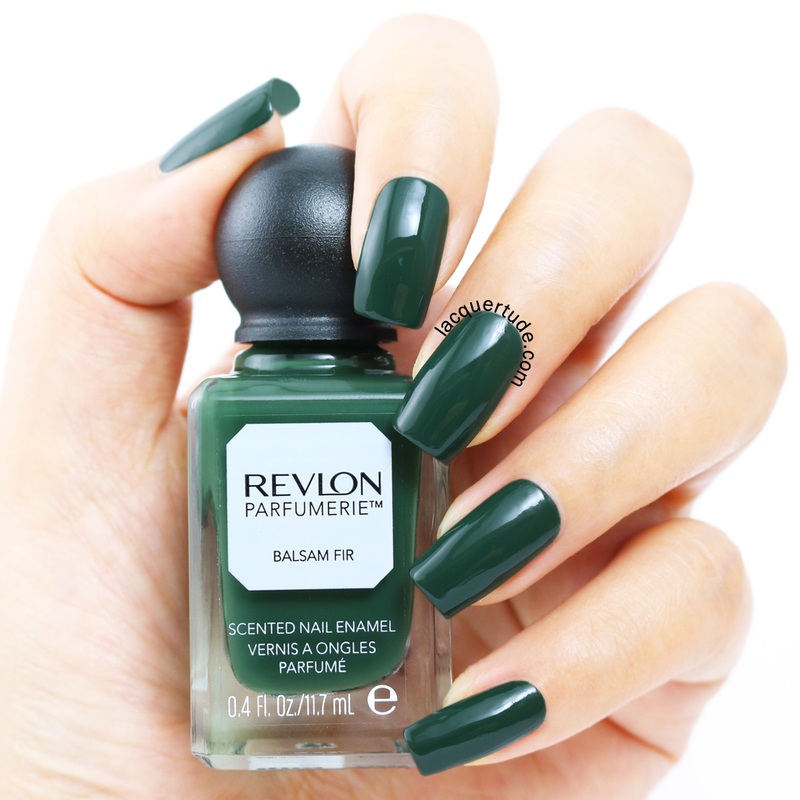 So, for a very reasonable price of $6.99 (in Canada), I think the Revlon Parfumerie Scented Nail Enamel line is really awesome. You can find swatches of other shades in this line on G’s blog Nouveaucheap. What do you think? Do you own any of them? Will you be getting some? What’s your opinion on scented polishes? Thank you so much for reading and have a wonderful week! 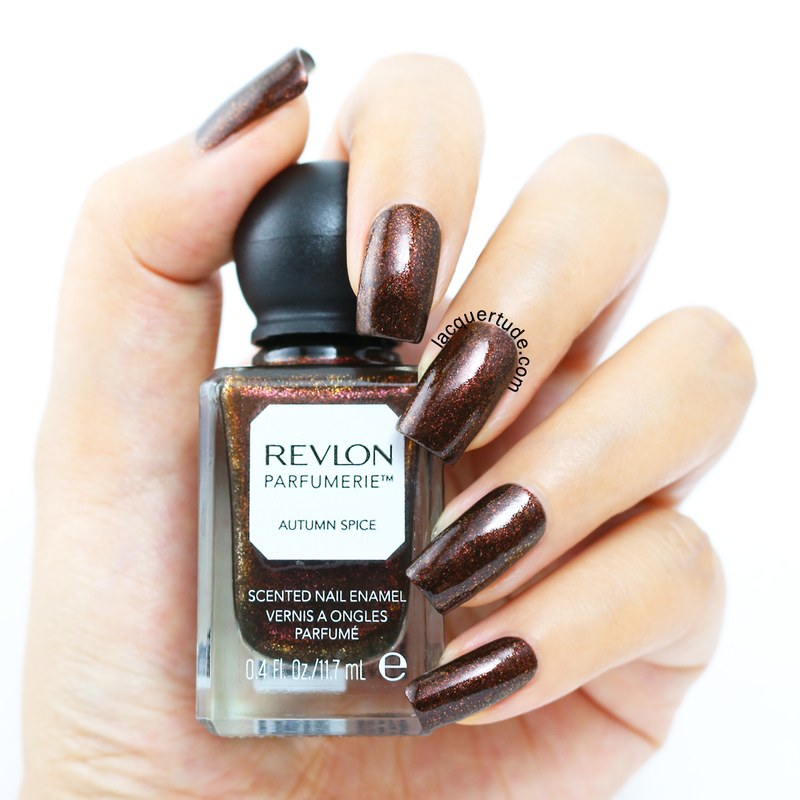 I’ve never been a big fan of Revlon polishes, but I absolutely love this line! Nice review! Thank you! I’ve never tried Revlon polishes before this line and I fell in love! The formula, the colors, the scent and those cute little glass bottles. So jealous – I wonder if these ever make it to the UK! Where did you get Balsam Fir? I still can’t find it! your swatches are absolutely amazing- I’m definately going to be picking these two colours up! You capture these really well and Balsam Fir omg I had no idea it had such beautiful colors in the bottle! I definitely wanna get my hands that shade for sure! I like the bottle shape too! Nice swatches!